1.Ishibashi, O., Inui, T., Mori, Y., Kurokawa, T., Kokubo, T., Kumegawa, M.: Quantification of the expression levels of lysosomal cysteine proteinases in purified human osteoclastic cells by competitive RT-PCR. Calcified Tissue International, 68; 109-116, 2001. 2.Inui, T., Ishibashi, O., Inaoka, T., Origane, Y., Kumegawa, M., Kokubo, T., Yamamura, T.: Cathepsin K antisense oligodeoxynucleotide inhibits osteoclastic bone resorption. 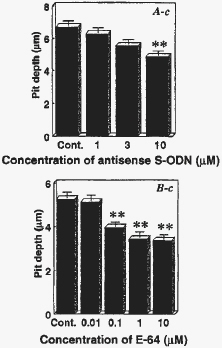 Journal of Biological Chemistry, 272, 8109-8112, 1997.